I am currently sitting at the desk in my best friend’s guest room, drinking raspberry cranberry soda out of a champagne flute (it tastes that better that way), and wishing we had made more pizza last night so I could have had leftovers for lunch today. What pizza you may be asking…really, really delicious pizza that I found via my favorite time waster of the internet…Pinterest! 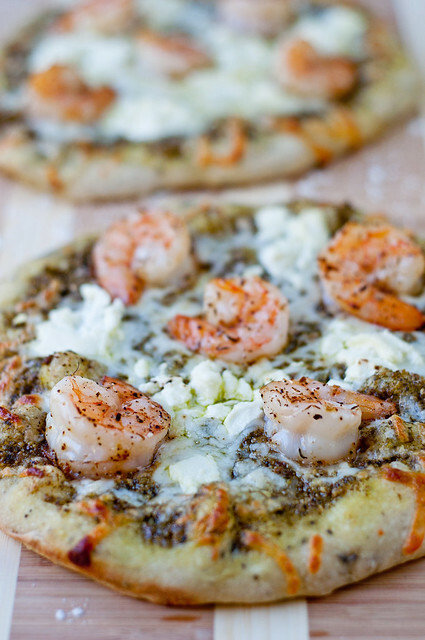 Shrimp and pesto pizza with goat cheese. We took some pictures, but it is an understatement to say the original pictures were much better than mine. (That was my version of a photo credit! – The website has been taken down now, but it was http://www.jaymimphotoblog.com/.) It is pretty basic, start with your favorite pizza crust; add on pesto, goat cheese (we used garlic and herb) and shrimp. We added in a little mozzarella and tomatoes. Needless to say, this recipe was quickly was moved into my Tried and True board. Bake and enjoy!